Onkyo adds 20 carat diamonds to its H900M headphones | What Hi-Fi? Now if there's one thing Las Vegas does well it's a bit of bling, and Onkyo has come up trumps in that department at CES with a pair of diamond-encrusted H900M headphones. Our sister brand Stuff was given an exclusive preview in a top-secret vault well away from prying eyes where the diamond-encrusted headphones are being kept under lock and key. The earcups decorated with a highly polished stainless steel ring and aluminium plate hand-studded with 20ct of top-clarity diamonds. And just in case that wasn't enough for you, the right earcups are denoted by an additional red ring of rubies. There's a hand-crafted white headband in soft leather, and naturally you wouldn't expect them to be mass produced. Oh no. These are strictly 'made to order' and take weeks to decorate. Onkyo is also showing off a similarly decorated pair of W800BT in-ear headphones, although if they were ours we'd be a bit nervous about taking them out and about with us. Now obviously this level of craftmanship doesn't come cheap. There's no word on the pricing yet for the W800BTs, but the diamond/ruby H900Ms will cost upwards of €80,000 (£68,500), depending on the exact specification of the jewels. 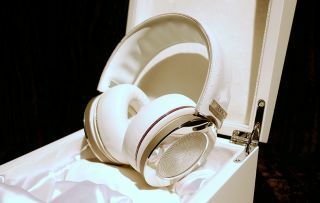 Onkyo isn't the only headphone company to come up with a bejewelled pair of cans here at CES. French hi-fi specialist Focal has also unveiled its Utopia Tournaire jewel-encrusted design which it is claiming is "the most expensive pair of headphones in the world". At $120,000, with a bespoke stand costing an additional $12,000, we can hardly disagree. You can read about the Focal Utopia Tournaire here.